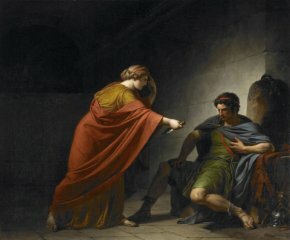 18/2/09 – Acquisition – Saint Louis, Saint Louis Art Museum - Francois-André Vincent exhibited two canvases representing Arria and Poetus at the Salon of 1785. This example of virtue is drawn from an anecdote occurring in 45 A.D. as narrated by Pliny the Younger. 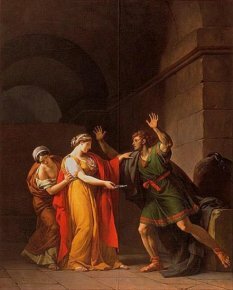 Having been imprisoned and sentenced to death by the emperor Claudius for supporting Scribonianus’ revolt in Illyria, Poetus hesitates in choosing a less humiliating death ; he is heartened by his wife’s suicide with a dagger. The large vertical canvas, commissioned by the king to be used as a model for a Gobelins tapestry, is held at the Musée d’Amiens  (ill. 1). Close in nature to the Oath of the Horaces by David, another, smaller version , was also presented to the public (there are several known preparatory drawings attesting to the artist’s doubts in choosing his composition ). This second canvas, of horizontal format, depicts a scene with only two protagonists, minus the servant included in the Amiens version, presenting a moment which appears a bit earlier in the narration. Arria evokes her first attempt when she had tried to kill herself knocking her head against the walls by pointing to her wounds with her finger. Another important variation is seen in the fact that Poetus here is seated, as opposed to the Amiens version where he is seen standing. 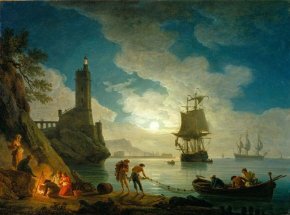 This work, dating from 1784, reappeared at the Hotel Drouot in late 2007 . It was once again seen at the Maastricht Fair last year at Richard L. Feigen’s stand and has just been acquired by the Saint Louis Art Museum  (ill. 2). A few months after Boston had acquired the large format by Callet (see news item of 21/7/08) and Dallas that of Niobé by David (see news item of 22/5/08), this is again proof that this type of painting, which many art dealers consider difficult to handle, is in fact sought after by important American museums. The very beautiful (and very selective) collection of the Missouri Museum includes several works by major 18th century French painters (Boucher, Fragonard, Chardin, Joseph Vernet, donated in 2006 – ill. 3 – Vigée-Lebrun…) but almost no Neo-classical paintings. The Vincent canvas will thus represent an interesting transition to the 19th century , reflecting the evolution in painting of that period. The large and swift strokes of the beginning, at times mistaken for Fragonard’s, are more subdued, the range of colours is colder, the style becomes more severe, inspired by the Bolognese school and Poussin. Let us remember that almost all of the great French historical painters of the second half of the 18th century have been studied in monographs in the last few years, except for Vincent. The one which Jean-Pierre Cuzin is preparing is eagerly awaited. Salon of 1785, n. 68. Matthieu Pinette, Peintures francaises des XVIIe et XVIIIe siècles des musées d’Amiens, Somogy, 2006, pp. 226 to 228. Salon of 1785, n. 67. The hang is known thanks to the engraving by Pietro Antonio Marini. Jean-Pierre Cuzin, Francois-André Vincent, Cahiers du dessin francais, IV, Galerie de Bayser, Paris, 1988, p. 21 and ill. 41 to 43. Etude Lombrail-Teucquam, on 27 November 2007 (sold for 138,000 euros with charges). Purchased by means of funding from Mr. and Mrs. John Peters MacCarthy and Christian B. Peper, as well as that of Horace Morison in exchange. The German school, from the 16th to the 20th century, constitutes the Art Museum’s strong point, although the French school, especially for the second half of the 19th century, also represents an important part of the collection.